This Eco-Drive Satellite Wave titanium bracelet watch is the perfect watch for someone on the move. Its innovative features include world time in 40 time zones, three sub dials, and day and date indicator. With a sleek titanium bracelet. 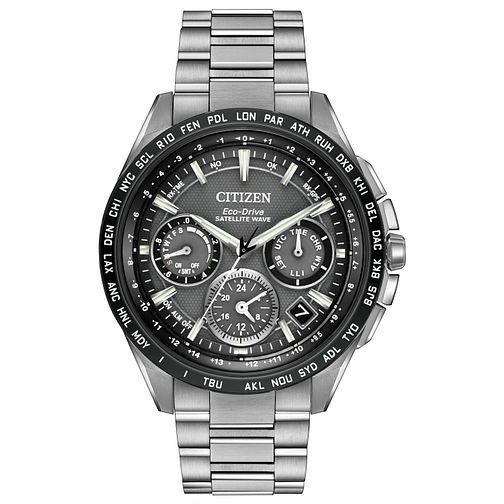 Citizen Satellite Wave Titanium Bracelet Watch is rated 5.0 out of 5 by 2. Rated 5 out of 5 by Anonymous from Great product This watch has to be the best one I have ever bought. It is incredibly light with GPS accuracy. It is a really good looking watch as well. Very impressed. Saved over £500 to boot. Rated 5 out of 5 by Anonymous from Absolutely fantastic. Absolutely fantastic watch, light as a feather and satellite accuracy is second to none. The watch strap adjustment is very similar to the rolex submariner as it slides in and out.